Fourteen-year old Marisol and her mother are on the run from their home in Tijuana, Mexico. Her father, investigating the drug wars as a journalist, has been murdered. But Marisol’s new home is a riverbed camp in a rich California suburb. A wildfire separates Marisol from her mother and her school. Cut off and alone, she challenges herself to find a way to reunite with her family and to celebrate the Day of the Dead in Mexico to honor her father with the proper traditions. 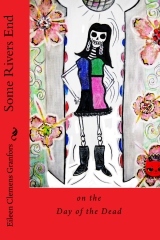 Some Rivers End is a book that will keep readers laughing, worrying, and cheering for its Hispanic protagonist, Marisol de Lira Lima. Some Rivers End will appeal to a wide audience, boys and girls, ages twelve and up as well as to adults. It is the first of a planned trilogy (coming: a prequel, The Pinata Maker’s Daughter and a sequel, So You, Solimar). Some Rivers End is “a terrific book, sweet, hopeful, and funny” with the last chapter “a joyful surprise” in the words of Eve Caram, novelist (Trio, 2010) and UCLA Extension Writers’ Program teacher. That sounds really excellent and it has a very long title, too! Your Muse must be doing a great job inspiring you. What’s the next project they’re helping you out on? I am so lucky to have a morning Muse. She finds me when I walk my dogs. Then I go home to write. Sometimes, it’s a flash fiction story and sometimes it’s a chapter in a novel. I have two novels that I’m working on. One is: the prequel to Some Rivers End on the Day of the Dead. It’s called The Pinata-Maker’s Daughter. It’s about Carmen from Some Rivers End. I think it’s awesome that she’s so dedicated and punctual. You are one lucky writer! Do you have any lucky characters? Are you like them? Hmmm . . .I am a lot like Marisol in temperament, trying to make good from bad and keep mean people from having too much sway in my life or habits. I was an English teacher for 36 years, so I have lots of similarities with Mrs. Kovacs, especially in handling wise guys like Stan in the book. Uh oh…I’ll try to watch my smart alec-ish-ness. Okay, serious now. What’s your favorite book of all time? OMG! You want me to choose one book? I know this is really bugging everyone! My favorite book in 2012 is Madeline Miller’s wonderful The Song of Achilles. But for all time, something I want to be sure the grandkids read? Probably, Pearl Buck’s The Big Wave because that’s when I fell completely in love with reading (third grade). Awww…I’m not much of a reader, I’m afraid, but I love your reason for picking The Big Wave. I’m going to really change directions on you here. In your opinion what makes a guy character swoony-worthy? I wrote my swoony-worthy guy in my second novel, Stairs of Sand. Phillip McKillop is suave and understanding, tall and lean, loves to dance, and loves his dog. Any swoon-worthy guy in my books has to love a dog! Oooh! My swoony-worthy guy is tall and loves to fly around. It’s not exactly the same as dancing, but close. Again, a difficult choice. I would ask for tickets to a John Lennon concert. I didn’t always get his message when I was younger. OMG! I told Kea Alwang I would pick John Lennon with George Harrison. We should totally go together! Are you ready Eileen? Because it’s confession time. What’s your biggest writing sin? My biggest writing sin is assuming my readers can follow a character’s stream-of-consciousness. I always have to edit those scenes like crazy. Would you say you are more of a rule follower or a rebel? I was raised in a military household, so Major Dad made sure we followed the rules, including mitered corners on our bed sheets. But when it came time for college, I flew the coop, surprising everyone by leaving San Diego for UCLA. Best decision I ever made! Good for you! I would fly the coop, but no wings yet. Now, what other than your very loyal Muse inspires you? love inspire me; sometimes, it’s a phrase of poetry or a memory from childhood. Definitely, the questions my students asked inspired me. I don’t think I ever asked my teachers anything inspirational. It’s part of the reason I skipped school and went straight to Earth on a Mission. But it’s nice to know you were a teacher who loved her students. So what would you want your them (your students) to take from this novel? My books carry the optimistic theme that “we grow strong in the broken places.” When we are hurt or bashed, we come back stronger. No difficult passage of life goes by without our learning and growing from it. Aww…Eileen I adore that theme!! It might be my favorite from all of these interviews. One last thing. Is there anything you’d like me to mention to your Guardian Angel? ‘Cause I totally have contacts. When you talk to my Guardian Angel, please let her know that I appreciate her presence in my life every single day. And that is lovely, too. It’s not said nearly often enough, in my opinion. It was great getting to know you, Eileen. Hey readers, you should check out her book on Amazon. This site includes all my books and book trailers too. And that does it for today – hey, Shel – oops she’s still writing, so come back tomorrow for a chance to get to know another author. May 2, 2012. Tags: author interview, confession, Eileen Granfors, guardian angel, Shel Delisle, some rivers End on the Day of the Dead, The Marisol trilogy, Winging It!. author interviews.